My friends all know how much I love food. I do truly it’s one of the loves of my life. I was devastated when two years ago I had to remove gluten from my diet. I’m not a gourmet chef, I’m actually no chef at all, and when I looked at the list of things I wouldn’t be able to eat, I felt like crying. I actually did cry – that’s how much I love food. But two years down the line, after embracing the impossible and removing most dairy products from my diet, I’m improving – health wise and culinary wise. I like easy recipes, the ones that don’t make you the prisoner of your own kitchen and as I am a working and studying mum I really value my time. It’s not very easy to find lovely gluten, dairy and nut free recipes. In many of them nut flours replace normal flour and because my son has a life-threatening nut allergy – well, you can guess the rest. I’m trying to use food to reduce the symptoms of endometriosis (I’m going to write about that soon, with different types of plans and approaches I found useful) and as I am passionate about healthy leaving I thought it would be nice if I could share some recipes on my blog as well. 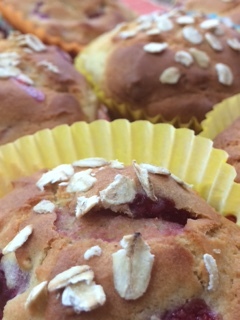 So here goes the first – lovely gluten and dairy free Oat Berry Muffins. Preheat the oven to 200C. Line the 12 cup muffin tin with paper muffin cups. In a large mixing bowl, combine the flour, 40g oats, baking powder, baking soda and salt. Mix with a whisk to blend. In another mixing bowl, combine the oil, maple syrup, and eggs. Beat together with a whisk. Add the yogurt and vanilla, and mix well. Pour the wet ingredients into the dry and mix with a big spoon, until just combined. Gently fold the berries of your choice into the batter. The mixture will be quite thick. Divide the batter evenly between the 12 muffin cups (for me it was 1.5 spoons in each). They will be quite full. Sprinkle the top of the muffins with the remaining 2 tablespoons of oats and sunflower seeds. Bake the muffins for 20-22 minutes, or until they are golden on top and a toothpick inserted into a muffin comes out clean. *Oats are gluten free, but can be contaminated with gluten, so if you are suffering with celiac disease or have a very strong gluten intolerance, please use gluten free oats. I hope you will enjoy this recipe. It’s easy and delicious.